Mark your calendar for the Mississippi Hospital Association’s Political Action Committee Golf Tournament on September 18 at the Dancing Rabbit Golf Course in Philadelphia. The event will begin at 9 a.m. and will feature a four-man scramble format. The PAC will award prizes to the top three teams. Individual prizes will also go to the winners of the “longest-drive,” “closest-to-the-hole,” "hole-in-one" and “Par-3-Poker” contests. We will also hold a raffle, where one lucky winner will have a shot for a million-dollar hole-in-one. Raffle tickets for the million-dollar shot will be sold for $10 each and proceeds will benefit the MHAPAC. For those who choose not to golf, there are many underwriting opportunities available. Underwriting sponsorships will be used to cover the costs of the tournament, including a hole-in-one sponsor, breakfast sponsor or beverage cart (just to name a few). For more information, contact Shannon Coker at 601-368-3250 or scoker@mhanet.org. The Mississippi Hospital Association Political Action Committee (MHAPAC) recently held the third annual Grenada Regional Golf Tournament at the Dogwoods Golf Club in Grenada. The event resulted in PAC proceeds totaling over $7,000. Valley Foods generously sponsored the lunch for this year’s event. Also, special thanks to all of the golf tournament sponsors: Baptist Memorial Health System, Forrest General Hospital, Midsouth Rehab Services, Grenada Lake Medical Center, MHA Solutions, HPICO, Johnson Controls, Batson Hospital, Professional Therapy Services, South Central Regional Medical Center, Montfort Jones Memorial Hospital, Neshoba County General Hospital, Kilmichael Hospital, Dean and Dean Associates Architects, Mississippi Baptist Medical Center, Wise Carter Child & Caraway, Healthcare Services Group, Mitchell Day Law Firm, and Ntelagent. If you missed the Grenada event, it is not too late to join in the fun! The MHAPAC will hold this year's annual central-region golf event on Friday, September 28th, at Dancing Rabbit Golf Club’s Oaks Course in Philadelphia. The golf outing will begin with a 9:00 a.m. shotgun start. A continental breakfast will be served before the tournament and a boxed lunch will be provided to golfers on the course. This annual golf tournament is one of MHAPAC's most popular fundraising events. Prizes will be awarded to the top three teams and winners of the "closest to the pin," "longest drive," and "hole- in-one" contests. All proceeds will benefit the political action committee and will be used for direct contributions to the campaigns of pro-health care candidates for public office. Slots for the tournament are limited on a “first-come first-serve” basis. Registrations are due on or before Friday, September 21st. We are also offering a $500 discount on the Platinum Sponsorship through August 21st. A networking reception will take place the evening before the tournament. The reception will include a raffle, where one lucky winner will have a shot for a $1 million hole-in-one. Raffle tickets for the million-dollar shot and other great prizes will be sold at the reception for $10 each. Last year's tournament raised over $30,000. MHAPAC hopes to increase this amount for a record turnout this year. A brochure with a registration form is attached below. For additional information, please contact Shannon Coker, MHA's Director of Advocacy and Communications, at 601-368-3250 or scoker@mhanet.org. Get ready to swing into action for the Mississippi Hospital Association’s Political Action Committee (MHAPAC) spring golf tournament. Make your plans now to attend the 4th annual Grenada event on Friday, May 25th, at the Dogwoods Golf Course. The shotgun start will begin at 10:30 a.m. Lunch, snacks, beverages and plenty of golf amusement are on this year’s agenda (just to name a few)! The annual golf tournament is a traditional PAC favorite that marks the official kick-off for the MHAPAC fundraising year. All proceeds from the tournament will benefit the PAC. Now, more than ever, political clout is important to help protect the health care and the hospital community. The critical events that occur in both Washington, D.C. and at the Mississippi State Capitol, make getting involved in MHAPAC more important than ever! Politics play a major role in health care and can seriously affect you on both personal and professional levels. One political decision can make a tremendous impact. By supporting MHAPAC, you are investing in the future of accessibility to health care and professional security. Most importantly, you ensure that MHAPAC can support pro-health care candidates for office! The 2012 MHAPAC hospital fundraising goal is $147,000. Fun events, like the PAC golf tournament, make it easy to donate and also provide a great networking opportunity. Right now, our future is left in the hands of state and federal elected leaders. Make it your business to be part of the decision, and participate in a great opportunity to benefit health care! Please see the attached brochure below to sign up now! If you do not play golf, please consider an underwriting sponsorship to help support the event. You may contact Shannon Coker, Director of Advocacy and Communications, at 601-368-3250 with any questions. Mark your calendars for the 2010 MHAPAC Annual Golf Tournament! The Mississippi Hospital Association (MHA) will host its 2010 MHAPAC Central Golf Tournament on Friday, September 17, 2010, at the Reunion Golf Club in Madison. Proceeds from the tournament will benefit MHA’s Political Action Committee (MHAPAC). A 10% Early Bird discount is available to those who register by August 2, 2010. All registrations are due by September 10, 2010. Our annual tournament is one of MHAPAC's most important fundraising events. As in previous years, the tournament will feature a four-man scramble with prizes awarded to the top three teams and prizes for "closest to the pin," "longest drive," and "hole in one" contests. We will also bring back the Par 3 Poker game and have a chance for a $1 million shot. MHA will host a cocktail reception the evening before the event. The tournament will begin at 9 a.m. Breakfast will be served before the event. Your registration fee will also include a box lunch served on the course, a goody bag, and door prizes. Please review the attached details about this year’s tournament, as well as lodging information. We hope to have a record number of hospital administrators and their senior staff members, as well as professionals in the health care business community. We hope you will consider participation and/or a sponsorship. The tournament is a fun fellowship and networking opportunity and a great way to support pro-health care candidates for office. Please fill out and return the form attached below as soon as possible. If you have any questions or need further assistance, contact Shannon Coker at (800) 289-8884, (601) 368-3250 or scoker@mhanet.org. Thank you for your support for health care in Mississippi! 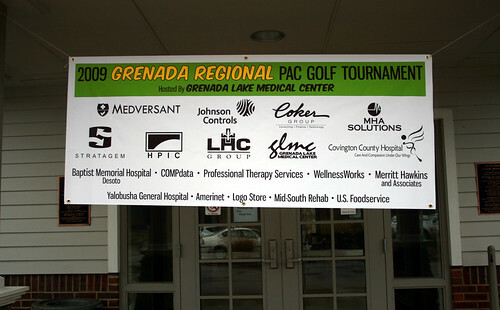 Grenada Lake Medical Center recently hosted the first annual regional MHAPAC golf tournament at The Dogwoods golf course in Grenada. All proceeds benefitted the Mississippi Hospital Association Political Action Committee. Chip Denton, CEO for Grenada Lake Medical Center and an MHAPAC Board member, proposed the tournament to generate additional PAC revenue. He wanted to help boost PAC funding, while allowing golfers who couldn’t make the September PAC golf tournament an opportunity to participate. The tournament sponsors were a real driver in making this first-year event a success. Corporate sponsors included: Coker Group, CompData, HPIC, Johnson Controls, LHC Group, Medversant, Merritt Hawkins and Associates, MHA Solutions, Mid South Rehabilitation, Professional Therapy Services and Stratagem. Amerinet, Logo Store USA, AIG VALIC and US Foodservice of Jackson generously provided door prizes and gifts. MHAPAC would also like to recognize hospital sponsors, including Baptist Memorial Hospital- DeSoto, Covington County Hospital, Grenada Lake Medical Center and Yalobusha General Hospital. Prizes were presented to the top three teams. Lee McCall, Larry Bourne, Ray Pate, Paul Gardner and Eddie Foster took first prize. Second place winners included Andy Carter, John Mark King, Earnie Petty and Chip Denton. The third place award went to Michael Fulton, James Franklin, Steve Lesley and Bill Patterson. Two additional prizes were given for the long drive and closest to the pin. Steve Lesley won the closest to the pin contest. Lee McCall, CEO of Jefferson Davis Hospital, received the longest drive award. MHAPAC staff sends a warm appreciation to Chip Denton and Grenada Lake Medical Center for creating a successful event. The PAC also thanks everyone who came out and took part in the tournament. We hope to see everyone again next year! See pictures of all of the golf winners here.